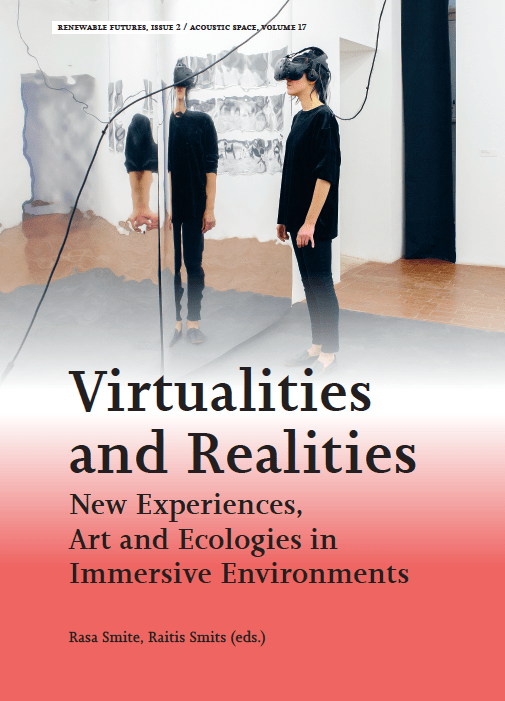 Great to have my work in collaboration with Seth Cluett on the cover of a killer journal on New Experiences, Art and Ecologies in Immersive Environments by edited by Rasa Smite and Raitis Smits. The exhibition that this work was shown in was @ the Kim? Contemporary as part of the RIXC festival. Price EUR 26,00 / USD 28,00 (+ shipping). Immersive technologies, coupled with superior virtual environments, artificial intelligence algorithms, faster processors, and biometrics, are launching a new era in virtual experiences, entertainment and interactive storytelling. At the same time these technologies have the potential for invasive monitoring and control. What are the present and future artistic strategies that deal with this? Combined with the acceleration of VR/AR and technologies of immersion, how will societies react? The first chapter of this book ‘re-approaches immersion’ by looking at artistic practices in VR environments, non-linear storytelling in 360-degree video, and brain sensor interfacesused in films and performances. The second chapter, on ‘technologies of the ecological’, discusses the role of arts in tackling climate change and creating augmentable experiences by combining digital with biological. The third chapter, ‘beyond interactivity’, shapes new theories for post-digital practices, while the fourth chapter addresses new economies of virtual experiences and questions artistic values. The volume also features a review of the exhibition – Virtualities and Realities (Riga, 2017), presenting cutting edge artworks that explore complex relations between the ‘virtual’ and ‘real’ in our post-media society, thereby creating new immersive experiences. Authors and contributors: Chris Salter, Ellen Pearlman, Monika Fleischmann, Wolfgang Strauss, Miguel Almiron, Guillermo Crosetto, Chris Hales, Luis Bracamontes, Oksana Chepelyk, Ludwig Zeller, Martin Rumori, Karen Lancel, Hermen Maat, Frances Brazier, Carlotta Aoun, Yvonne Volkart, Raphael Kim, Stefan Poslad, Raune Frankjaer, Patricia Flanagan, Karolina Żyniewicz, Anna Nacher, Mitch Goodwin, Vytautas Michelkevičius, Pauline O’Connell, Vincenzo Sansone, Ilva Skulte, Normunds Kozlovs, Varvara Guljajeva, Kathryn Blair, Raivo Kelomees, Sandra Álvaro Sánchez, Owen Kelly, Vanessa Sonia Santos, Mohammad Esmeail Bolouri, Maryam Bolouri, Timothy Smith, Elke Reinhuber, Josef Bares, Rose Marie Barrientos, Janina Hoth, Florian Wiencek, Marinos Koutsomichalis, Adnan Hadzi, Rasa Smite, Raitis Smits and Virtualities and Realities Exhibition artists. Miguel ALMIRON, Guillermo CROSETTO. Virtual Reality – a Place for Knowledge About Our Being and Empathy?